Brookline resident Bob Beiler says UPMC is holding the community "hostage," stalling plans for a new grocery store by not moving a medical practice. Up until a year and a half ago, grocery shopping was easy for Brookline resident Kay Thomas. There was a Foodland at the corner of McNeely Road and Sussex Avenue, and "I could walk down and buy a loaf of bread," she says. But in January 2008, the Foodland closed. Since then, says Thomas, a Brookline resident of 50 years, "If you want a green pepper, you've got to go for a long ride." The nearest grocers are the Kuhn's Market in Banksville, or the Castle Shannon Giant Eagle. "We desperately need a grocery store here." Last April, Thomas thought the community was about to get one. German grocery-store chain Aldi Inc. purchased the former Foodland for $1.6 million, with plans to erect a new, 25,000-square-foot store there. But more than a year later, those plans are still on hold -- and some say the University of Pittsburgh Medical Center is to blame. Before starting construction on the new store, Aldi needed two tenants to move out of the building: McNeilly Hardware and UPMC's Internal Medicine Associates. The doctors practicing at the location provide primary care -- physical examinations, preventive screenings, immunizations -- for adult patients. According to Bernadette Perri, who sold the building to Aldi, the hardware store moved out shortly after Aldi took over. "He was easy to deal with," she says. UPMC, though, hasn't budged. The medical giant doesn't have to go anywhere: UPMC's lease doesn't expire until 2011. But for the community's sake, says Perri, the health-care provider should have left by now. "This is an area that needs a grocery store," she says. Aldi and UPMC are saying little about the situation publicly. But Perri -- and many others in the community -- believe UPMC is demanding that Aldi buy new equipment for the doctors before agreeing to relocate their offices. Perri, who has been discussing negotiations with those tied to Aldi, says the grocery store offered to help find new space for the doctors' offices, as well as cover moving costs. "When I sold [the building] to Aldi ... we thought UPMC would be reasonable," she says. "But no way." UPMC "might talk 'community,'" Perri adds, "but when it comes down to it, they don't do it well." A grocery store would seem to have a built-in market: With roughly 23,000 residents, Brookline is the city's second-largest neighborhood. And although the old Foodland site isn't technically located in Brookline -- it's just across the city's border with Baldwin Township -- many city residents considered it "their" neighborhood store. "It's a real shame," adds Knecht, who has also heard that demands for new medical equipment are stalling plans. "[Aldi] could have been under construction last fall." "UPMC is kind of holding Brookline and parts of Baldwin Township hostage," agrees Bob Beiler, a board member for the community group. "UPMC should not be standing in the way." Still, some argue that the community is well served by the nearby doctors' offices. "It would be nice" to have a grocery store, says Baldwin resident Gloria Barber. "But I know a lot of people around here who use that medical center. It's really nice to have the doctors close." 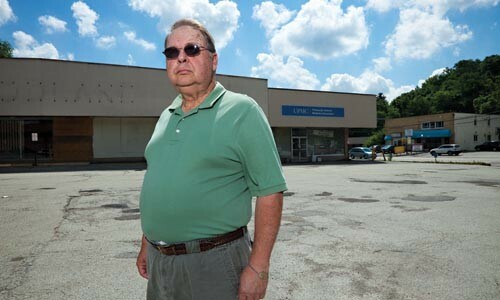 Ray Hall, who manages McNeilly Autobody Supply, across the street from the old Foodland site, says he visits UPMC's offices for regular checkups. While "I miss the Foodland not being there," the 62-year-old says, "the way the doctor's office is set up now is perfect." Aldi spokesperson Martha Swaney would not answer a reporter's questions, saying only that Aldi and UPMC are "still in negotiations." UPMC spokesperson Frank Raczkiewicz flat-out denies rumors that UPMC wants Aldi to pay for new medical equipment. "I don't know where they got that," he says. The problem, he says, is "We're having some difficulty finding a suitable location for our patients. Rackiewicz continues, "but our patients come first. When we find a spot that's good for us, then we'll certainly move." Rackiewicz says there have been negotiations with Aldi about the cost of relocation, but says, "I don't want to go into details." Building-owner Perri says she's identified two potential alternate locations for UPMC: one across the street from the Foodland site, and one in Castle Shannon. UPMC rejected both locations. Perri says UPMC worried that the parking lot for the Castle Shannon site was inadequate, but she says officials never gave her a reason for dismissing the location across the street from the Foodland site. "They don't have to move by law," says Perri. "But come on, let's go! It's just a big game, and I can't understand why." Perri argues that Mercy Hospital, which used to run the doctors' offices before being acquired by UPMC in 2007, was much easier to work with. "If this had been Mercy, we wouldn't have had to deal with this," she says. "Mercy was wonderful." Some residents are getting increasingly impatient with the delays. "UPMC is all greed," says Kay Thomas. "It's a shame." "Tell those doctors to get the heck out and go someplace else," echoes Brookline resident Mary L. Miller, 68. Still, others caution against bad-mouthing UPMC. Richard Weaver, for one, has recently started posting and handing out flyers, asking residents to write to UPMC and request that it step up its relocation efforts. "We don't want to ruffle feathers," says Weaver, an employee of the city's Bureau of Building Inspection who recently lost a city council primary race to represent the area. "If you get confrontational with UPMC, they might say, 'The heck with you.'" Weaver's flyer asks residents to "write a nice letter to ... UPMC executives for their help to get their offices relocated." On the back, the flyer includes contact information for UPMC's CEO Jeffrey Romoff, as well as two other officials. Trimming shrubs with her husband in the front yard of their Baldwin home on June 10, Norma Hirth says she would be happy to see Aldi open up a store, just a short walk from her home. "It would be good for the community," the 72-year-old says. "Having a store here would be a lot more convenient." But her husband, Curt Hirth, doubts that there's much anyone can do to change the hospital giant's mind. "UPMC," he says, pausing to pick up a pile of hedge clippings. "That's like arguing with God."